Although I've been a New Yorker for going on a decade now, I was born and raised in the heartland of good ole Kansas. Yes, there are Black people in Kansas. Having paid my dues as a resident there for so many years I believe that I've earned the right to offer a few observations about my home state. Kansas has pockets of progressive thought scattered here or there around the universities and colleges, but other than that Kansas is one big tried and true "red state." As a red state, it adheres to all of the traditional notions that are commonly prevalent amont red states, especially the issue of abortion. You might recall back in 2009 when abortion clinic Dr. George Tiller was literally shot dead in Wichita, Kansas while he was attending Church with his family. Shot dead. IN CHURCH! Ironically, he was killed by a "Pro-Life" activist; an irony apparently lost on his killer. The court found Friday that when he was attorney general, Kline committed misconduct by instructing members of his staff to attach sealed documents to a publicly filed document in violation of a Supreme Court order. He also told staff to file a court pleading that contained misleading information. The court further found that as Johnson County district attorney, Kline failed to properly advise members of a grand jury about Kansas law and sought to enforce a grand jury subpoena against the grand jury’s wishes. It also found that Kline gave false testimony to a judge and made “false and misleading” statements to the Supreme Court about the handling of patient records obtained during the criminal investigations. He also did not correct a misstatement to the state’s disciplinary administrator regarding the storage of patient records. The court on Friday rejected additional misconduct claims against Kline, including claims that he made inappropriate statements during a 2006 national television appearance. 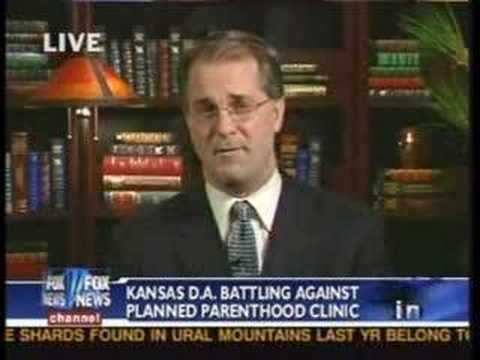 In 2007, Kline filed 107 criminal charges against a Planned Parenthood clinic in the Kansas City suburbs, accusing it of performing illegal abortions and falsifying records. The last of those charges were dropped in August 2012. He also pursued misdemeanor criminal charges against Dr. George Tiller because of late-term abortions performed by his Wichita clinic. The case was dismissed for jurisdictional reasons. Kline began the investigations of both providers just months into his 2003-2007 term as attorney general. The clinics resisted his attempts to get information from patients' medical records, but eventually the courts allowed him access to edited documents. Although attorneys are reprimanded by the bar for ethical violations all the time, it is rare for a state's highest legal officer -- the Attorney General -- to have their bar license snatched. Once you get to that level within the legal profession, you have to really mess up big time for the bar to go anywhere near you. Judges, DA's and politicians have a way of making those kinds of investigations disappear long before they gain any traction. But apparently Kline let this abortion issue blind him to the point where he just got sloppy. Did Kline cross the line in your opinion or was he just doing his job?